Department of Human Anatomy,Ahmadu Bello University, Zaria, Kaduna State, Nigeria..
School of Health Information Management Ahmadu Bello University Teaching Hospital, Zaria. Back ground: Most managers are yet to understand why reward and recognition programs are very necessary, and how they are used to motivate employees which in turn lead to job satisfaction. This study examined the impact of reward and recognition programs on employee’s motivation and satisfaction in General Hospital Makarfi Kaduna. Material and methods: Descriptive survey design was adopted in this study. The target population was 117 employees of the hospital. A sample size of 91 was used for this study. The questionnaire was employed as the research instrument. Descriptive statistics was used to analyzed and present the results. Results: The findings shows that reward and recognition programs gives employees extra motivation and job satisfaction which stimulate productivity. Conclusion:. The study concluded that dissatisfaction and demotivation in the job can cause staff to consider alternative employment; and that payment, promotion, working conditions and personal perception were factors affecting employees work satisfaction and motivation. Recommendation: The study recommend that managers of the hospital should placed more focus on reward and recognition programs, because it leads to motivation, higher job satisfaction and productivity. Key word: Motivation, satisfaction, productivity and employee. Reward system is a process that reinforces behavior to hit the target and meet the standards: Deci (1971) as cited by Ali & Ahmed (2008) explained that reward and recognition programs come within the discussion on extrinsically motivated behavior that occurs when an activity is rewarded by incentives not inherent in the task. Njanjaet al (2013) sees reward management as one of the strategies used by human resource managers for attracting and retaining suitable employee as well as facilitating them to improve their performance through motivation and to comply with employment legislation and regulation. Mound (2001) stresses that rewarding employee performance should be an ongoing managerial activity, not just an annual ritual. Rewards can be financial (pay, commission, bonus, profit sharing pensions, employee stockoptions, fringe benefits) or nonfinancial (praise, promotions, status, additional assignments, special awards, commendations, recognition). Lack of reward and recognition has a negative effect on stress and job satisfaction and could adversely influence employee turnover. According to Torrington et al (2008), burn out comes from being frustrated by trying to make an impact and not being recognized or listened to. Feelings of helplessness in employee germinate in a soil of unappreciative attitudes and bear the fruit of demotivation and dissatisfaction in the work place. (Njanja et al, (2013). In organizational settings, managers of human resources understand the great gains derived by linking rewards and recognition to their business strategy (Flynn, 1998). on the impact of rewards and recognition programs on employee’s performance, but non of such has been conducted in Makarfi General Hospital, Kaduna Nigeria. In recent time employee of Makarfi General Hospital have witness low performance and job dissatisfaction and demotivation due to lack of rewards and recognition in their work place. The design used for this study was descriptive studies and the type employed was survey which involves the used of questionnaire. The study population included employees of General Hospital Makarfi, Kaduna State, who had a total population of 117.The sample were determined using the formula of Yaro Yaraune as stated below. Questionnaire was used as the measuring instrument. The data gathering techniques used included a biographical section and the work satisfaction and motivation questionnaire section. The questionnaire was self-developed and consisted of nine dimensions that impact employee satisfaction and motivation. The nine dimensions include; work content, payment, promotion, recognition, working conditions, benefits, personal, leadership or supervision and general. All the data collected were processed and descriptive statistics was used to analyzed the data (mean and standard deviation). The results were presented using frequency tables. Out of 91 questionnaires issued to the respondents, 80 were completed and returned, representing 87.9 percent. 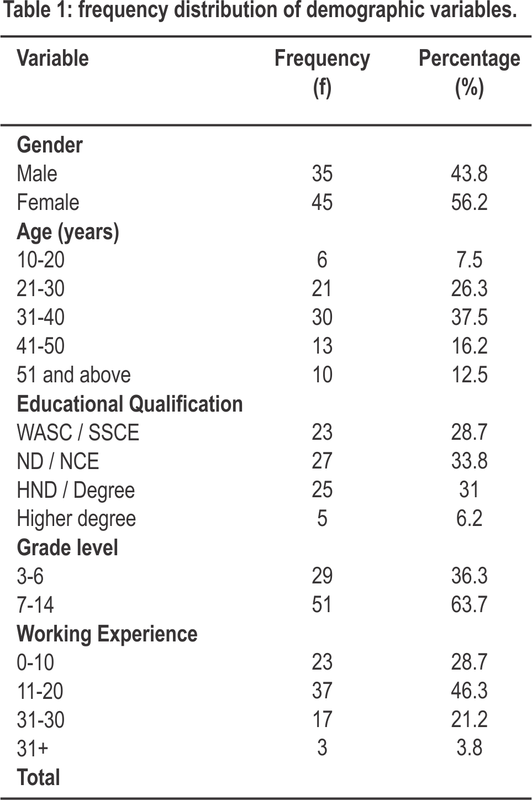 The table 1 above shows that the female respondents 45 (56.2%) were more than males 43.8%. the most represented age range was 31-40 years (37.5%) and followed by those from 21-30 years (26.3%). 33.8% of the respondents were holders of national diploma / national certificate, 31.3% had either HND/Degree, 28.7 were holders of SSCE / WASC and only 6.2% of them had higher degrees. Regarding the grade levels in the office, 51(63.7%) of the respondents were of grade level 7-14 and 29 (36.3%) were of grade level 3-6. This shows that majority of the participants were senior staff. Most of the respondents have 11-20 years (46.3%) working experience, 28.7% had 0-10 years, 21.2% had 21-30 years and only 3.8% of them have work above 31 years. Grand Mean (x) = 3.38. Strongly Agree (SD), Agree (A), Undecided (U), Disagree (D), Strongly Disagree (SD), Frequency (F), Mean ( ), Percentage (%). Regarding working conditions as work motivation and satisfaction table 3 revealed that 62.5% of the respondents disagree that it was not favourable, and 32.5% agrees the working condition was favourable. It was found that 75% of the respondents agrees staff mix freely with colleagues and have interpersonal relations. The grand mean rating for working conditions was 3.38. Table 3 indicates that the means for the work content, payment, promotion; recognition, working conditions, benefits, personal, leadership/supervisor, general and rewards and recognition programs ranged from a low of 2.01 to a high of 4.57. it therefore implies that employees in the sample are relatively motivated. However, the mean values for payment, benefits, and working conditions were the lowest. These mean values indicate the areas that employees were most likely to be dissatisfied and demotivated. This revealed that employees in the study were most likely to be motivated due to rewards and recognition programs, general personal, leadership / supervisor, work content and promotion dimensions. Majority of the respondent were dissatisfied with present salary. This finding was in disagreement with Ali & Ahmed (2008) who found that staff in the sample were relatively motivated by payment. The study’s results indicated that the hospital has definite policy regarding to promotion, and that staff promotion should be based on competitive basis as well as performance. The also indicated that the hospital accords the staff recognition and feedback on good performance. The employees reported that the working conditions in the hospital was not favorable, but however, staff mix freely with colleagues and they have interpersonal relationships. The results shows that employees’ benefits in the hospital such as pension, medical schemes and leave were not satisfactory. The findings revealed that employees shows positive attitude towards their jobs. Therefore, their personal feeling is one of the motivating mechanism in the work place. resultant positive impact on motivation and thus result in higher level of job performance (Ali and Ahmed, 2008). All businesses use pay, promotion, bonuses or other types of rewards to encourage high levels of performance (Cameron and Piece, 1977). 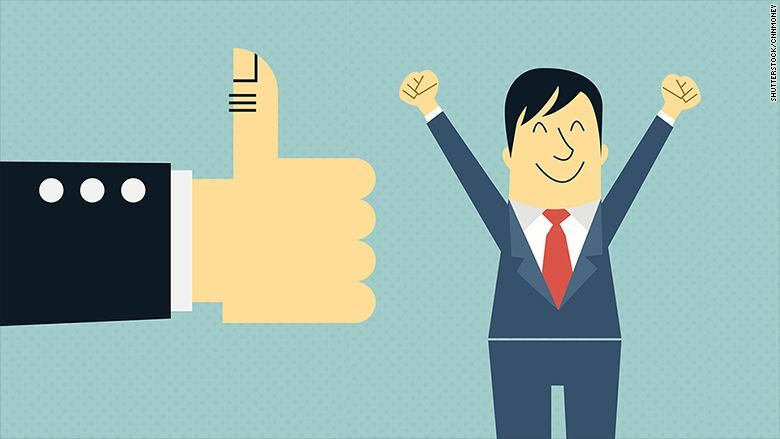 Recognition gives employees extra motivation and made them put in more efforts in their jobs. Ali and Ahmed (2008) found that there was significant relationships between work content and work motivation and satisfaction. In conclusion, the study indicated that the mean values for payment, benefits, and working conditions were the lowest, indicating dissatisfaction and demotivation. 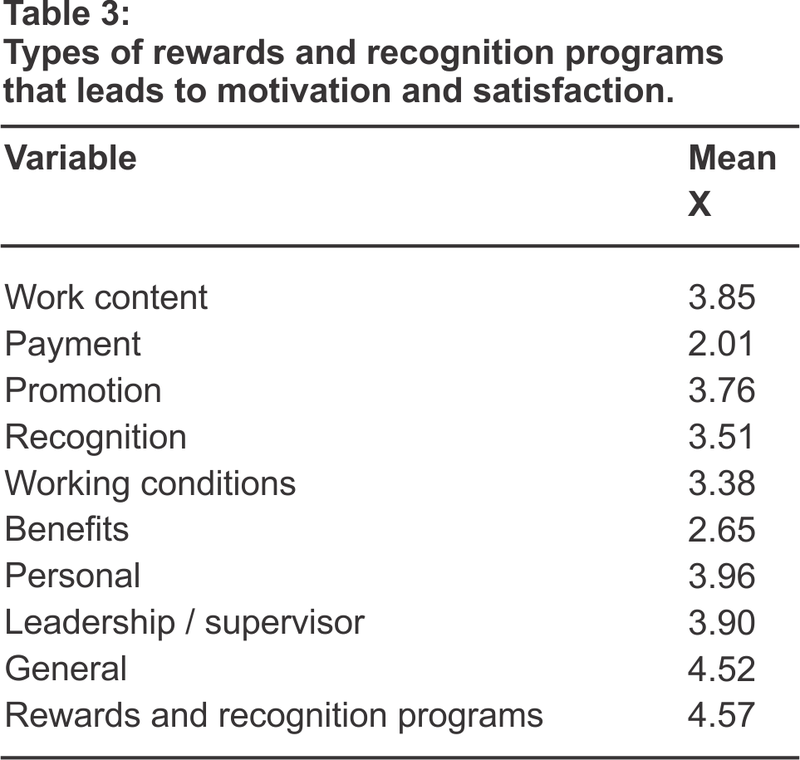 This implies that employees in the study were most likely to be motivated due to rewards and recognition programs. 1. Managers of the hospitals should emphasized more on rewards and recognition programs, because it leads to positive impact on motivation and higher job satisfaction. 2. The work place should be made conducive and safe to stimulate the staff to work harder. 3. Njanja, WL. Maina, R.N. &Kibet, KL (2012). Effect of Reward on Employee performance: retrieved from http://dx.dio.org/10:5539/ij6m.v8n21p41. 5. Maund .L. (2001): An Introduction to Human Resource Management. Theory & practice. Palgrave, Macmillan. 6. Park, K. (2009). Preventive and social medicine, (20th edition) M/S Bonarsidas Bhanot publishers 167, Prem Nagar; India. 8. Flynn, G. (1998). Is your recognition program understood? Work force. 77(7). 30-35. 9. Lawler, EE (2003) Treat people right. San Francisco Josey-Bass Inc.
10. Devanna M.A (1984) A frame work for strategy human resource management Strategic, New York,. pp 33- 51. Academic of Management Executive. 1(3):207-219. 13. Snell S. A and Schadur (2001) The era of our ways. Handbook of Strategic management. Oxford Blackwell publishing, pp. 627- 625. 14. Rafikul and Z. I Ahmad (2008) Employee motivation: A Malaysian perspective international journal of commerce and management. 18(4): 344-362. 15. Chew Y.T (2005) Achieving organizational prosperity through employee motivation and relation: A comperative study of strategy HRM practice in Malasia Institution, Research and practice in human resources management 13(2): 87-104. Prevalence of Macrolide Resistant Enteric Bacteria in Bloodstream Infections (BSIS) of Febrile Patients Attending Some Selected Hospitals in Zaria Kaduna State.